A new, comprehensive 224-page publication by the open-handed playing specialist, Claus Hessler! 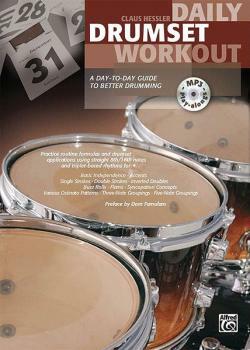 Here you can find everything a contemporary drummer needs to be able to play today. Claus teaches you new rhythmic skills that facilitate greater security and musical freedom. Whether you play rock, pop, funk, Latin, jazz, Afro-Cuban, or second-line music, the high-quality MP3 CD enables you to practice every exercise in every style in three different tempos. 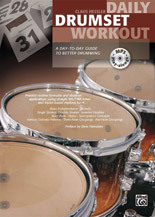 Each groove, style and tempo, using dynamics from very soft to very loud, are practiced in a daily routine, and through this technique, the player's response to the rhythmic grooves and patterns becomes automatic, allowing greater concentration on the musical aspects of modern drumming. Constant and ritualized practice will not only advance your skills at the drumset and help develop key competencies like endurance, discipline, structured thinking, and ear-training, but will give you the space and time to develop your own musical personality as well. Practice routine formulas and drumset applications using straight eighth/sixteenth notes and triplet-based rhythms for: * Basic Independence * Accents * Single Strokes * Double Strokes * Inverted Doubles * Buzz Rolls * Flams * Syncopation Concepts * Various Ostinato Patterns * Three-Note Groupings * Five-NoteGroupings.